This Nordic drama about a group of Somali pirates that hijack a cargo ship in the middle of the Indian Ocean is nail-bitingly intense, thanks to some powerful performances and Tobias Lindholm’s strong direction and fantastic script. Written and directed by Tobias Lindholm (who co-wrote last year’s The Hunt), A Hijacking tells the intense story of a group of seamen, whose boat is hijacked by a group of Somali pirates in the middle of the Indian Ocean. Demanding a ransom of millions of dollars from the shipping company’s CEO, Peter (Søren Malling), the pirates hold the seamen hostage until an agreeable fee can be negotiated. But with the Copenhagen authorities refusing to meet the fee demanded, time passes by, food supplies run out and the pirates’ patience is tested, leaving the hostages in an intensely difficult and dangerous situation. A Hijacking marks the second feature film of Tobias Lindholm and the young Danish filmmaker certainly proves he’s one to watch with this incredibly intense film that’s driven by his fantastic multilingual script. Although the scenes with the Copenhagen authorities discussing the negotiation process are stimulating and arresting, the most appealing scenes take place on the boat, where Lindholm creates a powerful sense of tension and claustrophobia. 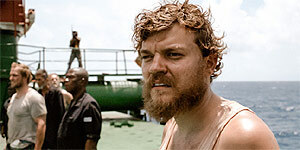 As a whole, the acting is collectively convincing and impressive with Pilou Asbaek (who plays the film’s leading seaman character, Mikkel) and Søren Malling providing the film’s standout performances. Combined with Lindholm’s stellar screenplay and superior ability at creating onscreen mental distress, they make this powerful film wholly engaging from start to finish. Playing Connor Julian, the team’s negotiator, Gary Skjoldmose gained his role by accident after dropping Lindholm a message to offer his experience in Somali hijacking to the project (fascinatingly, Gary was part of the emergency response team during a Somali pirate takeover in 2008) and unfortunately, his amateur acting skills and lack of onscreen experience are laid bare as he delivers a rather off-putting weak performance. However, with Søren Malling by his side at all times, Skjoldmose’s efforts thankfully don’t damage any important scenes. Worth seeing? Impressively acted and commendably directed, A Hijacking is a hugely enjoyable and engaging drama that will keep you on the edge of your cinema seat. Highly recommended.